In my article of The Present Alien Intervention on Earth the so-called Allies of Humanity, channeled by Marshall Vian Summers, explain that one part of the plan to bring humanity under the control of the Visiting aliens is a staged Return of Christ. They talk about a human looking physical being genetically bred, who will portray himself as Jesus returned to earth to help humanity. This will result in a world religion under authoritative rule. The Return of Christ is a theme that continues to show up in alien messages, how strange this might sound. Many years ago, I read a very similar scenario in a book written by Jan Van Rijckenborgh, the former head of a small Dutch Rosicrucian organization (Lectorium Rosicrucianum). He was kind of a mysterious figure and a strong mystic. He wrote many books about the need of self-development and transformation. He mentioned a staged Return of Christ in his book Unmasking, published in 1958 (but written a couple of years earlier). He does not mention extraterrestrials, but instead talks about entities in a ‘reflection-sphere’ which is the realm where the deceased reside. In the natural order of things, the lower energy body of the deceased will dissolve too. But some of these entities do not want to evolve and rise to the higher spiritual planes. They need life energy to extend their stay in this reflection sphere. They need to get it from the living, and that is why they will stage a Return of Christ because this will engender a release of a lot of life-energy by those who will believe in it. These entities work together with certain people still in the physical body to create this Great Play. It is interesting that some UFO researchers has come to the conclusion that some extraterrestrial entities are able to steal life energy from people for their own purposes. Maybe there is some collaboration between these two groups? Is it possible that van Rijckenborgh is using the term ‘entities’ to refer to collective of extraterrestrial races that at present are intervening with humanity? The description he is giving of the entities in the reflection-sphere does seem to correspond with the description that Marshall Vian Summers gives of the extraterrestrial collectives. Van Rijckenborgh describes the entities as “It is a combine of such brotherhoods whose only basis is: need of self-maintenance. For, generally, there is great animosity or rejection among various groups. But when need be, they join and form one combine of interests.” This is only speculation from my part. The following are quotes from Unmasking so you can make up your own mind. It is interesting that Van Rijckenborgh published this book in 1959. He must have had some good source of information, as some of the things he describes can be correlated to information that only recently has become widely known. Comments in brackets are mine. “There is going to be staged neither more or less than the Return of Christ, as we find it described in various apocalyptic prophesies. This performance will be put over with power and gigantic phenomena based on natural science. The entire world will be affected by it, and no spot on this earth will be left untouched. The regimes of all countries will be interfered with and a world government instituted. The whole world be resound with the ‘peace on Earth’ motive. Except for a few minor but fundamental details, it will be so perfectly ‘real’ that no doubt practically the whole of humanity will take the sham for the reality and react accordingly. The details of these exceptions will be that, for instance, the wolf is not going to live on peaceful terms with the lamb; and the kid will not lie beside the leopard – unless both are made to do so by means of injections! “Some day in the near future, in the morning, in the afternoon or in the evening, people will be listening to their favorite radio programs, be they sermons, other speeches, plays or concerts. At one of the high points of the broadcast, when the attention is supposed to be the greatest, the sound will suddenly fade away – become inaudible – and all listeners will hear a voice, a beautiful, deep, loving voice, announcing that there has been no interference at the broadcasting station, that the broadcast will resume very soon, but that is only a short interruption for a communication which is addressed to all in the name of god, and intended for all. 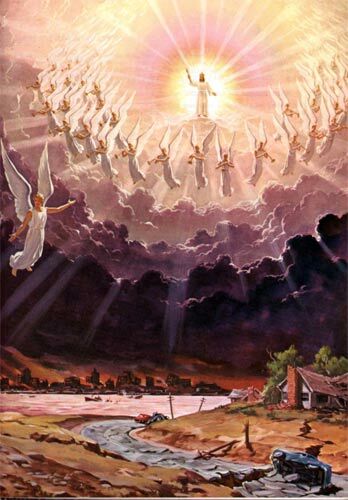 It will be stated that the Great day of the Lord has come, the Day of the return of Christ, and that all the people are invited to prepare themselves for that day and hour. This radio incident will take place at the same moment as regards all broadcasting stations then in operation. The incident will last only a few minutes. And, in fact, the ordinary program will resume the next moment. Neither the preaching minister, the playing orchestra, nor the staff of the broadcasting station will know at the time what happened; for actually there will not be the least interference! from the broadcasting station reaches the radio sets; whereas, at the same moment, the thus blocked broadcasting station can be imitated with another apparatus. The entities, performing this work belong to certain orders or brotherhoods who have their domicile in the Polar regions, as, for instance and among others, in Greenland. These are entities of a male and female nature, of whom frequent mention will be made in the near future; for the mention of these orders will be used for the Great Play in very many ways, about which we shall inform you as fully as possible. These people are masters of popular psychology and know better than anyone else how they will have to handle certain nations and races. “After the strange and so-breathtaking radio message about ‘the Day of the Lord’ which has come, the Great Play will continue in producing atmospheric phenomena of a mass-enrapturing nature all over the world. All those who have been familiarized from childhood with the exoteric interpretation of the Holy Language of the Bible, and all those who have long forgotten this Language, and those who have misused this language or desecrated it, or can only scoff at it – they will all shudder and, in great terror and fear, rush to the churches and places of worship that they used to attend in the days of yore. There will not be enough room to seat them all! Mass meetings will be organized which will be called ‘humiliation assemblies’; millions will offer up supplications to the various deities for salvation at the eleventh hour, now that ‘the Great day of the Lord’ has come, and sense of sin has been tardy and weak. In this manner, the production of lightpower will be tremendous. And this will increase the strength of the hierarchy of the reflection-sphere. Above all metropolitan and housing centers, in all countries and all sections of the world, without a single exception, the atmospheric phenomena in question will be seen at set times, with steadily increasing frequency, finally even daily. People will think that heaven has opened! A great silence will come. The sky will be covered with beautiful blendings of pastel colors. Traffic will stop and all will look up. Then mighty music will resound, heavenly singing will be heard, and faces will appear around One, who will be recognized by all as Jesus the Lord. “Following these powerful scenes of the Great Play, further developments are but a child’s play, namely, the positive, actual appearance of the hierarchy already mentioned! They will come to the front and establish complete leadership in all countries of the world. And this is not only ecclesiastically, but also politically, in order to institute, a would-be Christ-theocracy, carried through and made concrete as a Great Play. It is also interesting to note that Van Rijckenborgh also predicted that “At about the end of this century, to be exact in the year 2001, the epoch of the Great Pyramid ends. Then it will not become a thing of the past, a monument which reminds one of former times, but then it immediately begins anew from the bottom up. Because there are intercosmic currents and radiations, which have an orbit of 6300 years.” Whatever he means by that, a lot of change has happened since that year, both worldly events as an immense growth in people’s consciousness. He explains that if humanity reacts in a positive way then mankind can walk a new Path of Liberation, if it makes the right choice.